On the evening of the 13th December 2018 I imaged Comet 46P Wirtanen using my Canon 600D DSLR with UHC filter and 75-300mm lens at 135mm. I was able to take x33 two minute light frames at f/4.5 and ISO 1600 and later stack these with x10 temperature matched dark frames and x50 each flat and bias frames using Deep Sky Stacker. The master image was then processed in StarTools. 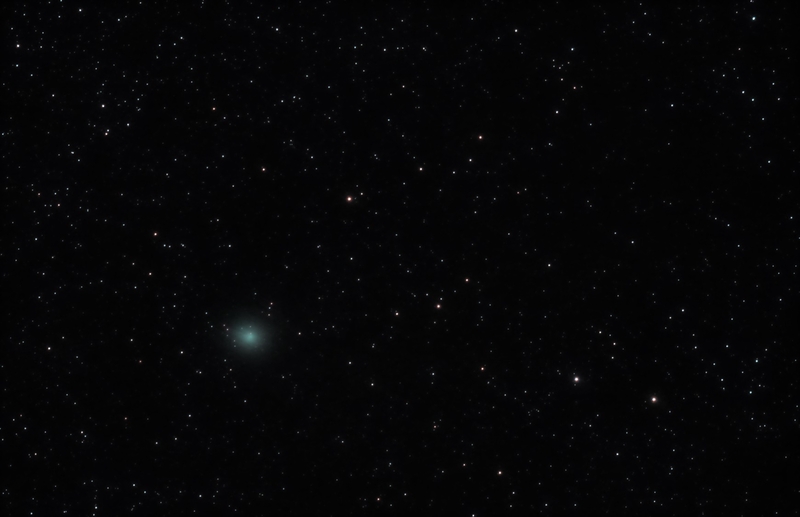 Due to deficiencies in DSS I had to process as separate layers in StarTools a stationary comet and stars background but learnt a lot doing so.